The FourTrax Rancher is one of the most versatile ATV’s on the market. The Honda Rancher’s durability, toughness, and dependability are all incredible aspects of this ATV, but the characteristic that sets the Rancher apart from the rest is the ability to choose from a huge range of Rancher options, in order to find one that exactly fits your wants and needs. 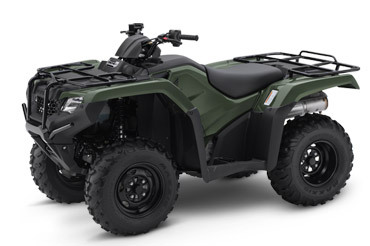 Depending on whether you need an ATV for your ranch, trail riding, hunting/fishing, farm or job site, the Rancher has options that allow you to comfortably and effectively complete almost any job. The Rancher allows you to take a basic model, and add all of the necessary features to fit your needs exactly. Whether that is an independent rear suspension, two or four-wheel drive, Honda’s special electric power steering, or an automatic dual clutch transmission, the Rancher was built to support them all, and with an array of colors to choose from. With all of these options plus more, your fitted Rancher should feel like a tailored suit when its completed. The Rancher ES model comes with everything the base model Rancher comes with, while adding an Honda’s electric shift system, in order to make shifting smoother and easier.